You can also access up-to-date information on all study abroad programs, apply online to the program of your choice, and read stories shared by peers who have studied and lived abroad. Plan for the time of your life! Why should BC Institutions Participate in the Consortium? Participating institutions can promote their own study abroad programs to students within the Consortium while fulfilling key goals towards internationalization and supporting best practices in student experience. Marketing Reach: Consortium member institutions can promote study abroad programs to over 350,000 students province-wide. Viability: Smaller and regional institutions can more readily offer student abroad programs thanks to province-wide marketing and exposure. Diversity: The Consortium promotes diversity amongst student abroad participants. 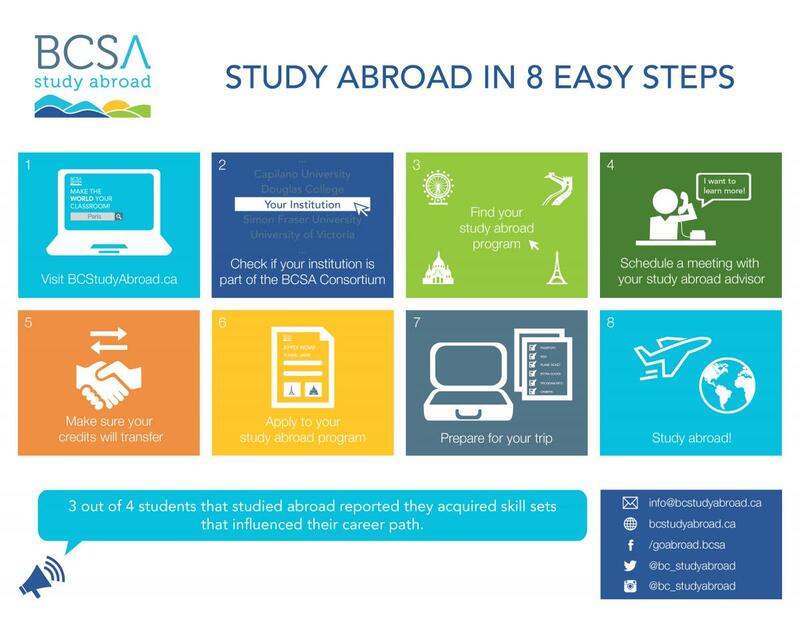 To join the BCSA Consortium please contact info@bcstudyabroad.ca. The following institutions are part of the British Columbia Study Abroad (BCSA) Consortium. You can select an institution below to find out what kind of short term study abroad options they offer. *Institutions marked with an asterisk do not currently offer short term study abroad programs to students outside their institution. Study abroad programs offer students alternative study environments, international experiences and exposure to diverse cultures while earning credit towards their degree. 8. Have the time of your life! Study abroad programs are offered in destinations all over the world! Search for short term study abroad opportunities on this website, for more detailed information regarding the exciting range of possibilities that are open to you. Do I have to have travel experience in order to study abroad? For most study abroad programs, no previous travel experience is required. An open mind and strength of character are extremely helpful when faced with cultural differences that may prove challenging. What are some examples of the requirements institutions have for studying abroad? Each institution has different criteria to be eligible to study abroad - please contact the Study Abroad Advisor for specific requirements pertaining to that institution's SA programs. If you have a disability, study abroad remains an option worth exploring. Speak with a Study Abroad Advisor at your home institution to determine what accommodations or assistance you will need and to explore potential study abroad options. Although there may be some limiting factors, there are various support organizations that may be able to help you with your study abroad plans. Mobility International USA (MIUSA) is a non-profit organization with excellent resources dedicated to expanding opportunities for people with disabilities. Check out their website at www.miusa.org. Another excellent resource for students with disabilities who want to study abroad is Studying Abroad: A Guide to Accessible University Programs and Facilities for Students with Disabilities. Do I have to be enrolled in a specific program to study abroad? Study abroad programs are offered across many disciplines. Search BC Study Abroad’s list of short term study programs by discipline or sub-discipline, to find the program of your choice. At what point in my academic career can I study abroad? Please meet with a Study Abroad Advisor at your home institution to discuss specific study abroad criteria and guidelines, since they will differ by institution and discipline. There are a variety of study abroad options available, from two weeks to one full academic year. The short term study abroad programs listed on this website range from two weeks to two months. Each institution has a different set of processes, requirements and documents that must accompany a student's application for studying abroad. Check with the destination institution hosting the short term program or field school you are interested in for specific application requirements. Remember to also check with your home institution regarding any documentation required to grant you permission to participate in a short term study abroad program outside your home institution. What happens after I've been accepted to study abroad? Each institution has a variety of requirements you must complete before you go. Many programs have a pre-departure session, which will cover topics ranging from how transfer credits will work, to information on cultural adjustments, health and medical insurance and the application process for passports and visas. How do I apply to a short term study abroad program on this website? Each institution has a unique individual process for applying to study abroad. Each program listed on this website has an “Apply Now” button. This button leads to a brief form, which allows you to send an email to the destination institution hosting the short term program or field school. It also notifies your current home institution of your interest in applying for this program. Both institutions will contact you with further information about the application process. I do not speak a second language. Are there courses available in English? Absolutely! We have a range of programs and most institutions offer at least some instruction in English. You will find language requirements on the description page for each program. If I decide that study abroad is not right for me, is it possible to withdraw from my program after I have been accepted? It is possible to withdraw from a program once you have been accepted, however it is not encouraged. Each program has their own withdrawal and refund procedure, so you will have to contact the Study Abroad Advisor at both your home and destination institution to find out the specific policy. Do I get credit for all the courses I take while studying abroad and will my courses transfer back to my home institution? You will get some credit for the courses you take while studying abroad, as that is part of the agreement between the Consortium schools. How much credit, however, is determined by each institution. Be sure to clarify this in the initial planning stages to make sure that you are getting the amount of credits you require! Each destination and each institution is different! You may be staying in a hotel/hostel or you may be staying with a host family. Search for a study abroad program to find out the specifics for the program(s) you are interested in. What kind of support is offered by my home institution? Most home institutions will assist with your application process, the transfer credit process, cultural preparation through pre-departure sessions and orientations and re-adjustment to life as is upon return. Culture shock is a common feeling that many people experience when they are exposed to an unfamiliar culture, way of life, or set of attitudes. It is an emotional and behavioural reaction to living and working overseas and involves an adjustment to everything from the food to the language to learning how to mail a letter. Adjusting to a new culture can be difficult and frustrating, and at times you may feel depressed or homesick. These are completely normal reactions and you are not alone. The most important thing you can do is talk about your feelings and build a support network for yourself. Your home institution and your destination institution both have programs that can help you with this. You can also look at our website and travel guide page for other sources. Reverse culture shock refers to the anxiety and feelings an individual may experience upon returning to their home country after living and studying abroad. Although your family and friends have probably heard about your adventures through email and phone conversations, they were not there with you to personally experience it. As a result, their reactions to the “new you” may appear to be distant as they try to understand the full impact of the events that have shaped your views and attitudes into what they are today. Allow yourself some time to relax, reflect and adjust to life back at home without losing the ideas and lessons learned while you were abroad. How can I manage reverse culture shock? Try to use your new knowledge to understand your own culture from an international perspective. To help ease your re-entry process, make sure to attend any orientation or welcome home sessions offered by your home institution to find out new and interesting ways to integrate your recent study abroad experience with your continued life and studies. Find opportunities to practice your newly acquired language skills by taking advanced language courses, joining a language club, or seeking out a conversation partner. Start a travel blog on your experiences and post pictures and share stories with people. Attend workshops, meetings, foreign cultural gatherings or international clubs that can provide the opportunity to meet other students who have studied abroad, as well as international students. Share your insights into the daily cultural, academic, political and social realities of life abroad with students who are considering studying abroad; they are certain to be interested in what you have to say. I identify as an LGBT individual. Should I be concerned about discriminations while studying abroad? Depending on the country in which you are traveling to, the acceptance or discrimination of individuals who identify as LGBTQ can vary greatly from your home country. Community policies, laws and socially acceptable behaviour may be different in foreign countries, and local governments may or may not provide the same level of protection or support of individuals' liberties in the LGBTQ group. Public decency laws, prejudices and attitudes will fluctuate depending on societal norms, however, attitudes may be less prejudicial than you may expect. It is important to research the situation in your host country before departure, one place to start is with the institution that is running the program. They have already researched the country that you will be visiting and may be able to help you with any questions you have. Consult the following websites for some helpful resources for LGBTQ travelers. Are there safety risks involved in studying abroad? Pre-departure orientation sessions help to reduce the risk as institutions try to select and prepare students appropriately for their experience. Despite preparations for departure, students need to take the appropriate precautions in order to have a safe and successful trip. The best way to prepare yourself for studying abroad is to research your destination thoroughly. Can I still study abroad if I am in a wheelchair? Yes. You will have to work with your host institution's study abroad office, but studying abroad while in a wheelchair is a definite possibility! One good starting point for resources is Mobility International USA.